New Jersey Gov. Phil Murphy signs a bill to raise the state's minimum wage to $15 per hour by 2024. It becomes the third-largest state to do so, following California and New York, as labor advocates push for pay hikes around the country. The federal minimum wage has not risen from $7.25 since 2009. Phil Murphy, governor of New Jersey, speaks while Ras Baraka, mayor of Newark, left, listens during a budget press conference in Newark, New Jersey, U.S., on Wednesday, June 27, 2018. New Jersey Gov. Phil Murphy signed a $15 per hour minimum wage into law Monday, making his the latest state or locality to hike its wage floor amid nearly a decade of federal inaction on the issue. The plan approved by the Democratic governor and state legislature will gradually take New Jersey's minimum wage to $15 per hour for most workers by 2024. The state's current pay floor of $8.85 per hour will rise to $10 on July 1. 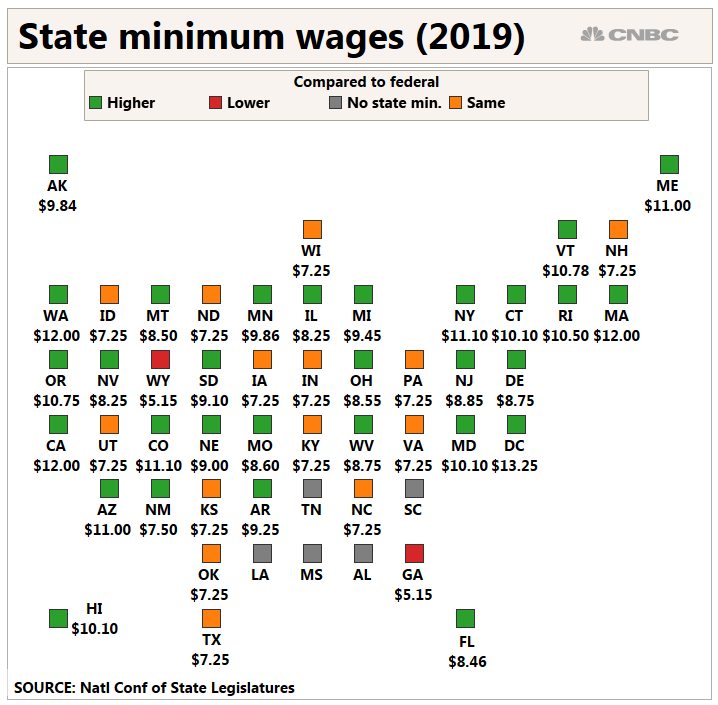 New Jersey becomes fourth state overall, and third-largest, to hike its minimum wage to $15 per hour as momentum for pay increases grows around the country. States including California and New York and cities from San Francisco to Seattle and Washington, D.C., have taken the same step. The wage floor more than doubles the federal mark of $7.25 per hour, which took effect in July 2009. In a tweeted statement ahead of the signing, Murphy said that "for far too long, too many of our fellow New Jerseyans have struggle to survive on wages that have not kept up with the cost of living." Labor advocates led by groups such as Fight for $15 have pushed for wage hikes nationwide as they argue pay has not kept pace with the cost of living. The effort has reignited a debate about whether minimum wage increases will help low-wage employees keep up or hurt them and the businesses who employ them, who in some cases say they have to reduce their staff or the hours they work. "When fast-food workers first started walking off the job six years ago, nobody gave us a shot," said Wanda Rogers, a McDonald's worker in St. Louis, Missouri, in a statement sent by Fight for $15. "But by going on strike, speaking out, and acting like a union, we've turned a $15 minimum wage from laughable to reality. The new Democratic House majority has brought the minimum wage to the forefront at the federal level. Last month, the party introduced legislation to raise the federal pay floor to $15 per hour by 2024. Though the bill likely will not pass the GOP-held Senate or get past President Donald Trump's veto, Democrats used it to try to cast themselves as the better party for the working class. Minimum wage hike proponents have argued pay has not outpaced inflation enough. The U.S. minimum wage hit its high in 1968 at $11.83 per hour in 2018 dollars, and has not approached that level in decades. While real wage growth adjusted for inflation had been sluggish, it has started to pick up in recent months. Real average hourly earnings rose 1.1 percent in December year over year, compared with 0.8 percent and 0.7 percent increases in November and October, respectively, according to the Bureau of Labor Statistics. Average hourly earnings climbed 3.2 percent unadjusted for inflation in January, though the government will not release real wage growth data until later this month. The argument for a higher wage floor is particularly potent in New Jersey. 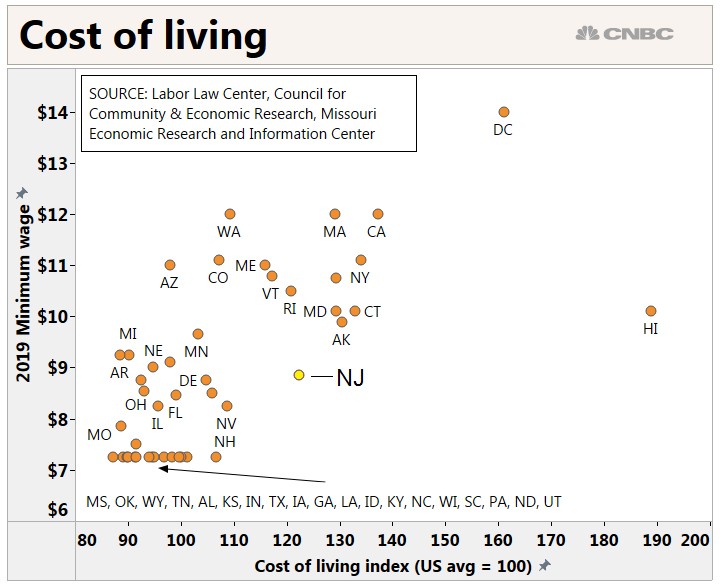 Driven by housing costs, it has the 10th-highest cost of living among the 50 states and Washington, D.C. The New Jersey Chamber of Commerce did not oppose a $15 per hour pay floor in an expensive state for low-wage workers, the organization's president and CEO, Thomas Bracken, said. However, the group objected to the bill that ultimately passed because it sought a longer phase-in period for the $15 wage and wanted more businesses exempted from it, among other goals. "It's not the number, it's how long it takes to get there," he said. The Chamber of Commerce also pushed for a provision for businesses to suspend the wage hikes in the case of an economic downturn, which did not get in the final bill. Bracken worries that plan will make New Jersey a less attractive place both to live and start a business.